Horseback riding creates a multi-dimensional movement similar to a human’s gait. This motion leads to increased flexibility, balance, core strength, gross motor skills, and endurance. Additionally, improvements in intellectual functioning, focus, problem solving, confidence, self-esteem, social skills, and bonding often occur. Reductions in anxiety, respiration and heart rate are also common. Therapists may be consulted, but goals are set by the certified instructors and focus on the leisure activity of riding. Each lesson is planned and facilitated by a PATH Intl. Certified Instructor or Instructor-in-Training working under the guidance of a Certified Instructor. Lesson plans with goals and objectives are prepared for each student as the instructor helps the student work toward the ultimate goal of independent riding. Ride for Joy serves individuals of all ages, from 4 to 104, with physical, emotional and cognitive needs. RFJ has a waiting list for services. Following receipt of a completed, mailed application, the student’s name is placed on the waiting list. The application is screened to determine if there are any physical or mental contraindications that would make equine assisted activities inappropriate for the applicant. If not, and there is room for new participants on the current schedule, an evaluation will be scheduled. 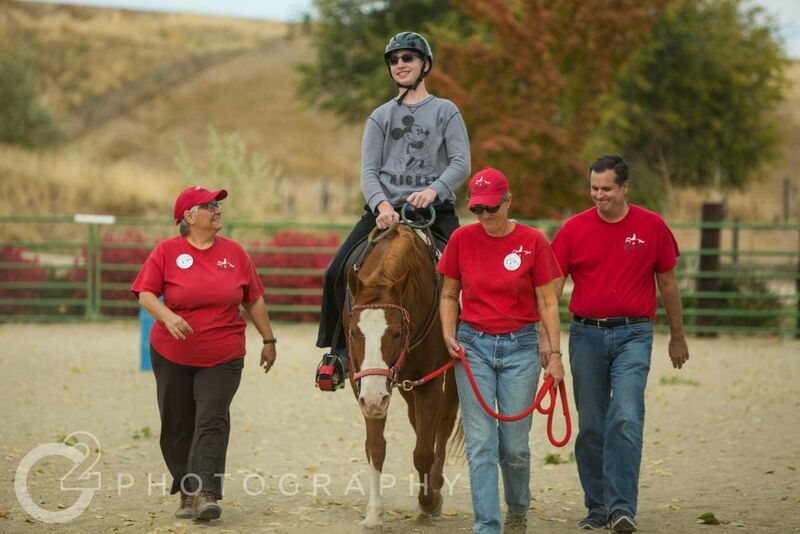 All applicants are evaluated before being admitted to the program to ensure that riding lessons can be safely provided and benefit the rider. Evaluations are generally scheduled a few weeks before the beginning of session. An email is sent to all wait list students and evaluations are scheduled first come, first served. Students will be asked to complete simple tasks and mount an imitation horse to determine appropriateness for the program, tack, and horse assignments. An evaluation is also required for returning individuals who have not participated in Ride for Joy for more than 12 months and may be required for other returning individuals, at the sole discretion of the Ride for Joy staff. Lessons are scheduled on a first come, first served basis and are paid by the session. A typical eight week session costs $80 (price subject to change). After evaluation and admission, students typically ride one day per week for 20-45 minutes, depending on the student. Lessons may be group, semi-private or private. Sessions last from four to eight weeks and are seasonal. All admission and scheduling decisions are made at the sole discretion of the Ride for Joy staff. All students who are new to RFJ or who have not ridden in over one year must complete a New Student Application. All active riders must complete a Returning Student Application yearly. "I wanted to say thank you for all you do and all you have done. Ride for Joy has been the best therapy for [my son] by far. And I'm happy to report that since [he] started working with Chance [his horse], there has NOT been the need for [him] to wear diapers at night. He has not wet the bed or had random accidents, which I'm super happy and grateful about. Please say thank you to Chance for me and to all the amazing people who have worked with [him]."